Explainer videos are short, often animated, videos that are used to concisely describe and demonstrate a product or service. Explainer videos can have a powerful impact on their audiences. Let’s look at examples of the main types of explainer videos and the reasons why they are so effective for businesses. The sheer amount of information available on the internet is overwhelming. As the human attention span shortens, consumers need to immediately be able to understand what a product or service is and how it makes their life better. And they want to know it now…not after reading 10 pages on your website. This is the primary reason explainer videos are one of the most effective forms of content a brand can publish. When it comes to educating prospects on your products and services, video is hard to beat. In a survey conducted by Wyzowl 45% of businesses using video marketing indicate they have an explainer video on the home page of their website. Of those businesses, 83% described the home page explainer video as effective. Studies demonstrate that our brains are hard-wired to respond to storytelling in marketing. Not only are stories the way we experience the world, but they also help us organize information and label some things as good, and other things as bad. A good explainer video can have a strong positive impact on your business by communicating the value of your service or product in an emotionally persuasive visual format. Choosing the type of explainer video that is the best fit for your business depends heavily on your product or service. 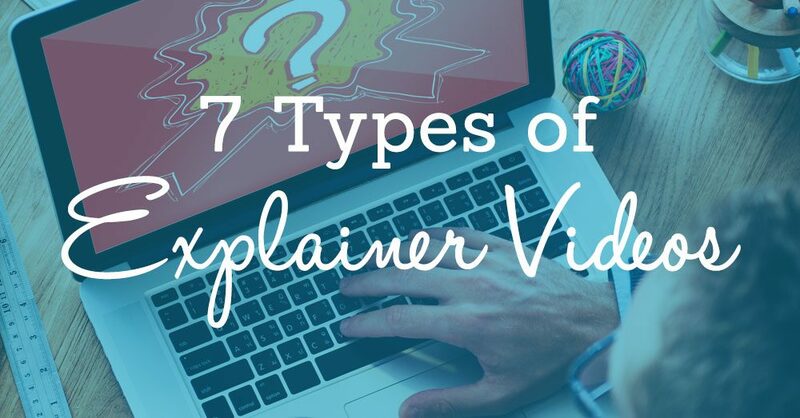 If you’re considering an explainer video for your business, here is an overview of some of the different types of explainer videos to help you find the right style for your product or service. Animated Explainer videos are easily the most widely used type of explainer video. Animation is ideal for explaining services or abstract, intangible products such as software. Some services and software possess very few physical features, which makes live-action video impossible. Besides allowing for more creativity in the concept of the video, animated explainer videos are more easily updated than live-action video. This allows for flexibility to accommodate anticipated future changes to a product or service. Often thought of as traditional animation, 2D animation involves creating characters, storyboards, and backgrounds in a two-dimensional environment. 2D animation is often a less expensive option than 3D animation. However, some explainer videos may need extra detail that can only be accomplished with 3D animation. Always make sure you’re using animation in a strategic way. Some topics, especially those that call for a human touch, can actually be harmed by using animation. This animated explainer video featuring Mia the Marketer uses comic-style 2D animation for SalesFusion’s marketing automation platform. We transform Mia into a marketing superhero to highlight and explain the power of the SalesFusion software. 3D animation involves animating objects appearing in a three-dimensional space. These 3D objects can be rotated and moved like real objects. This is extremely powerful for showing products that are still in development or difficult to film in live-action as demonstrated in our iBox video for Hansgrohe. This beautiful award-winning explainer video using 3D animation helps demonstrate the benefits of Care Logistics’ service. Motion Graphics explainer videos bring still graphics to life with animation, visual effects and other cinematic techniques. They are not necessarily story-based or character driven and may involve animating abstract shapes, logos or text. IR Coder is a software platform that helps hospitals decode the billing process. We built this eye popping motion graphics sales video to help them tell their story. Whiteboard animation is a style of animated video where a story is shown on a whiteboard using artwork that is typically hand-drawn in appearance. This style of video lends itself to processes which yield cheaply-made whiteboard videos, such as homemade videos or through a company that uses automation to produce them. This uptick in poor quality whiteboard videos is in danger of giving whiteboard explainer videos a bad name as a whole. With a good script and high quality character animation, a whiteboard video can certainly be a viable option for companies. This is especially true when working within a tight budget. Tread carefully and weigh the true cost of a poorly made whiteboard video before going with the lowest bidder. With whiteboard videos, it’s necessary to go beyond the conventional and think outside the box to avoid a bland, forgettable brand experience. This video by IdeaRocket for PG&E is a good example of combining whiteboard animation style with traditional 2D animation to create a high quality video production. Like animated explainer videos, Live Action Explainer videos accomplish the same goals of explaining your product or service, they just do it with real people. Using flesh and blood people in an explainer video is a good option when you really want to connect with the viewer on an emotional level. This is often a good choice for people-oriented products and services as demonstrated in this explainer video for TeleAck. You may have heard that animation is less expensive than live action video production. There are many factors that affect the cost of a video production, so this isn’t always the case. Screencast explainer videos incorporate imagery from a screen while a website, software or application is in use. The main purpose is to show how the application functions. They are very effective for showing users how to interact with new apps or features without requiring them to read many pages of text. Screencast videos can often be less expensive to produce than animated or live action videos, however, this doesn’t mean you should skimp on quality. Creating a simple low-res screencast video is well within the reach of anyone with a computer and the ability to upload to YouTube. This makes it even more important to invest in quality when creating a video that represents your brand. This stop motion inspired web video ad for the My Kodak Moments app is elevated above a simple screencast video by combining elegant animation with great screencast imagery. Your explainer video should be one of your most valuable marketing assets. Get the most return on that investment by using it to reach prospects in multiple places. Increase click through rates by 65% by mentioning your explainer video in the subject line of email marketing campaigns. Homepage: Definitely include your explainer video on the home page of your website. This is the page that receives the highest traffic, so featuring your explainer video prominently will help quickly inform new visitors. Email Campaigns: Mentioning the word ‘video’ in your email subject lines has been shown to increase click through rates by 65%. Put your explainer video to work by mentioning it in the subject line and linking to it from email marketing campaigns. Sales Meetings: Arm your sales team with video ready mobile devices. Starting a sales meeting with an explainer video unifies sales messaging, and saves the sales department a lot of time and effort. Landing Pages: Landing pages designed to convert visitors are ideal for explainer videos. In a case study by Eyeview Digital, they found that video on a landing page increased conversions by a whopping 86%. Retargeting Ads: Get your explainer video in front of people who visited your website, but didn’t take action, by running retargeting ads. Sometimes, they just need a friendly nudge in the right direction in order to convert. Sales Outreach: Warm up cold leads by referencing your explainer video in sales emails. Don’t forget to mention it in the subject line. Social Media: Share your explainer video regularly on your social media channels to increase engagement. For social platforms that permit it, consider pinning it to the top of your profile so it receives maximum exposure. Which type of explainer video is right for my company? The style of explainer video you choose should be consistent with your brand’s personality. If your brand is laid back and playful, then your explainer video should be, too. Remember, best practices for video always apply, so tell a great story, keep your content short, and remember your audience.